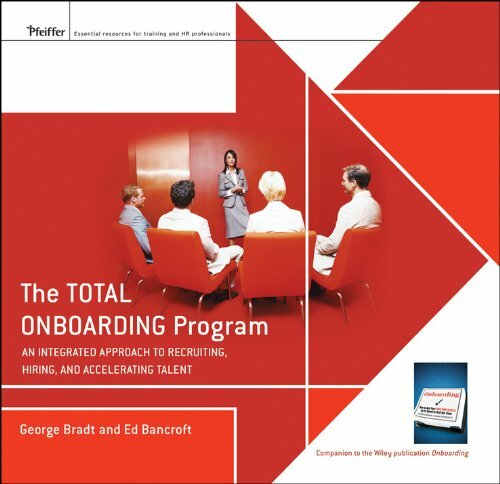 The Total Onboarding Program provides training and HR professionals with a detailed approach for bringing new and recently promoted employees up to speed and productive in half the usual time. In this Facilitator's Guide set, George Bradt -- author of The New Leader's 100-Day Action Plan -- and Ed Bancroft share a complete training package of proven tools, techniques, and tricks of the trade that help organizations reduce hiring or promoting risk and increase retention rates, identify and avoid the most prevalent landmines that derail new hires, and develop an onboarding framework that can be consistently deployed in any organization. Based on years of experience working with Fortune 500 companies, the authors? techniques will inspire and enable new employees to deliver better results faster. Their program presents the core concepts of onboarding -- alignment, acquisition, accommodation, assimilation, and acceleration ? and includes agendas, worksheets, and slides for five meetings and 11 workshops, ranging in time from two hours to two days, so you are completely prepared to present the program to teammates.